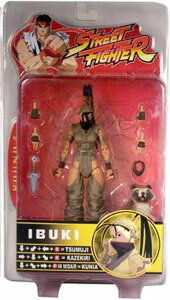 Description Of Item: Street Fighter - Ibuki. Celebrating the 15th anniversary of Capcom worldwide phenomenon Street Fighter! These 6 and 1/2 inch tall, highly articulated figures (20 points) are fully poseable and faithfully replicate the look and attitude of the classic characters!